The analysis based on Competitive Intelligence helps you to position your brand against the competition to assess if the strategies set out are appropriate and to identify points for improvement. You will obtain a market overview of your sector and how the competition is positioned. You can anticipate the changes and actions of the competition to provide a quick and effective response. For example, to detect and prevent a brand crisis, or to propose a new marketing strategy. You can identify new business opportunities, detect hidden information or new insights. You will get guidance to know when to develop new products or services, diversify the market or enter new niches in the market. The Competitive Intelligence analysis provided by Lynguo allows you to extract data about social share and share of users, the reputation of the monitored brands or the most viral content. WOULD YOU LIKE TO PERFORM A COMPETITIVE INTELLIGENCE ANALYSIS? Analyses social share and share of users of different brands or interests monitored in order to know the repercussions of a theme, brand or certain campaign. In the graph below, the content of Brand 3 (in turquoise) had a peak share on the 7th at 2:00pm then dropped drastically during the night. We can interpret that the peak share could coincide with the launch of a product on the website, but then losing the interest of the audience throughout the day. Brand 4 (in red) maintains its percentage of mentions low throughout the week. This could mean that its content does not have much impact. 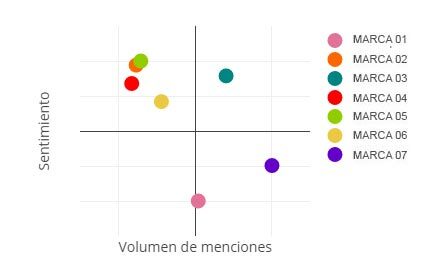 The graph below shows two axes, which correspond to the volume of mentions (the further to the right, the more mentions the brand has) and the sentiment (the higher the point, the more positive the sentiment) of 7 different brands. 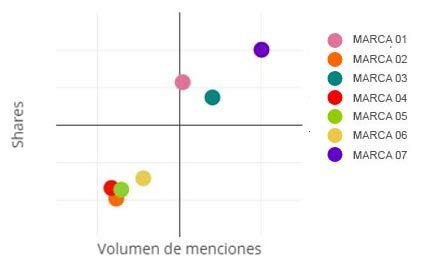 We can see that Brand 3 (in turquoise) is in a privileged position compared to its competitors: The sentiment of the comments is very positive and the volume of mentions is very high. For Brand 1 (in pink) the sentiment of the comments is the most negative and the volume of mentions is low. This brand would be in a situation of reputation crisis. Discover the volume and sentiment of the mentions of users regarding different brands in order to detect new business opportunities, redefine marketing strategy or improve message engagement. This information is offered in SWOT format, in order to compare your brand with the competition and to help measure each of the actions taken on social networks. Discover the most popular content through different metrics, such as the number of likes, retweets or comments, to detect publications that generate the most engagement and, for example, to be able to create and distribute similar content. The following graph shows two axes: share (the higher the brand is situated, the more retweets it has) and volume of mentions (the further to the right, the more mentions the brand has) of 7 different brands. The content of Brand 7 (in purple) is obtaining very good results: it is regularly being retweeted and the number of mentions is very high. The content of Brands 2, 4, 5 and 6 (in orange, red, green and yellow respectively) is the least retweeted and also has the lower number of mentions. Their marketing strategies would have to be modified to improve positioning against competence. 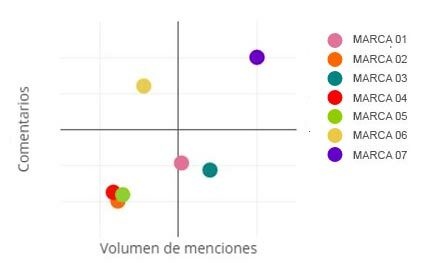 The following graph shows two axes: Comments (the higher the brand is situated, the more comments it has) and volume of mentions (the further to the right, the more mentions the brand has) of 7 different brands. 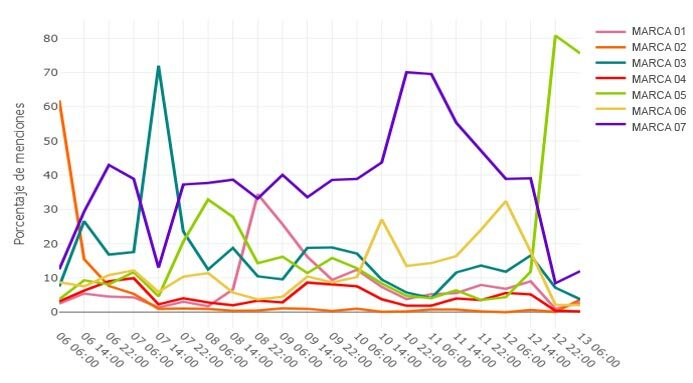 The content of Brand 7 (in purple) is enjoying a high level of diffusion: it has a large number of comments and the volume of mentions is very high. The content of Brands 2, 4, 5 and 6 (in orange, red, green and yellow respectively) is the least retweeted and also has the lower number of mentions. Their marketing strategies would have to be modified to improve positioning against competence. Lynguo analyses social share and share of users of different brands or interests monitored.